Why Should You Partner with RaceThread? It's free! When searching for their next race, an athlete always questions, "I wonder what others have thought about this race?" Well, now they can know and you can promote the great reviews you get on RaceThread! Any race director can go onto RaceThread.com, find their race's profile, claim their race and update all the information on the respective profile with the accurate information from year to year. But to take it a step further, we would like to partner with you to provide a direct link for participants to review your race so you can have that feedback and improve your race year after year. RaceThread is a database of race information. For each race on our website, we have a plethora of information for the user to know, no matter what stage they are in their search. We want to provide completely accurate, updated information to all our users and we need your help to do so. Stop relying on word of mouth or what you over heard on the day of the race for what to improve for next year. Give a chance to every participant to voice their likes, dislikes and suggested improvements. For our partners, we provide a dedicated link to the review form on RaceThread.com for you to send out to all participants in the days after the race. Within two weeks after the review link is sent to participants, we will provide a fully designed summary of all the reviews (see below). Link building refers to the process of getting external pages to link to a page on your website. It is one of the many tactics used in search engine optimization (SEO). As RaceThread is an external page, we link to your race's website throughout your race's profile which is one of the best things you can do for SEO by increasing the amount of these external links to your website. Google loves it when there are legitimate and viable links back to your website and will in turn reward you by ranking you higher when a user searches for your race. Nothing for the Standard Plan! Every race is FREE to claim and provide standard race details such as race date, race distances, address, location, and race description. You can also copy and paste the provided post-race survey link to embed in your post race email. The Plus Plan is $49/race, per year, which in addition to the standard plan, allows the race director to respond to user reviews, add additional race details and course specifics such as course type, course scenery, parking information, pre/post-race expo details, award age groups, etc. The Platinum Plan is $99/race, per year, includes everything in the Standard Plan and Plus Plan, in addition to providing full post-race email support and distribution of surveys to your race participants. You will also receive a post-race survey spreadsheet detailing review specifics and the nitty-gritty comments and thoughts of your race participants. What's the difference between claiming a race and partnering with RaceThread? Any race director can claim a race. If you would like to partner with RaceThread, we will provide a dedicated link to send to participants that goes right to the review form. From this, we will also provide all the reviews received on the website a couple weeks after the form is sent out. Partner with us now and we will be dedicated to marketing your race to our athlete community in the future - contact us now to partner! Who is behind this RaceThread website? RaceThread was created in 2014 by Michael Ryan out of a need to help athletes of all ability levels find their next great race. He was frustrated by the lack of quality races and the inability to search for races based on location, distance, time of year, and most importantly, reviews from other like-minded athletes. Whether it was poor race organization, mediocre medals, or courses without much scenery, he felt others in the race community should be able to find a race other than just word of mouth. His vision is to offer the user the ability to write/explore race reviews, and research logistics such as course maps, dates, race location, weather and transportation/lodging options. With more than 40,000 races, RaceThread has become the most detailed, thorough, and up-to-date website about athletic races. Can we take a bad review off the RaceThread site? No, to be authentic as possible we keep every review of the race on our website. Although, we do have a profanity filter where swear words and foul language reviews will be moderated by RaceThread support staff and removed ONLY if inappropriate, vulgar, or offensive language is used. Can I respond to a negative review? Yes! When you have subscribed to the Plus Plan, you are able to respond to user's reviews individually. Just login to your account, go to your race(s) page, and click on 'Respond to user review.' Once you respond to a review, that user will automatically receive and email with your response to their comment. Do I need to give you all of my participant's information/email addresses? No, we give you all of the information for the email and follow up email including the suggested content (to be edited in any way you see fit) and the link to the review form on our site. 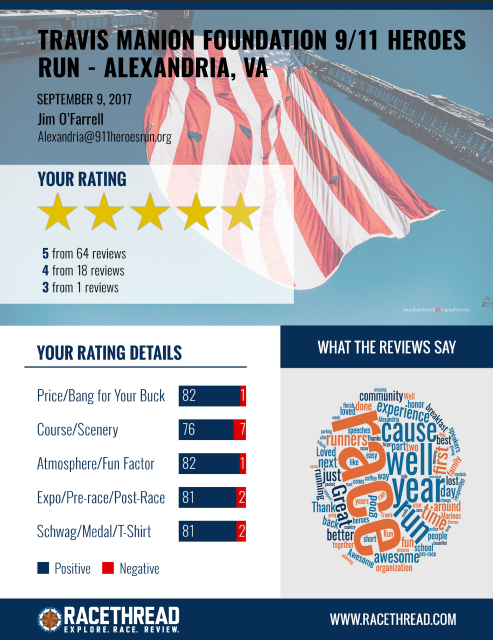 Can we highlight our overall star rating or good reviews on our race website? How do I claim a race? Click on "Claim this Race" on the individual race page. Enter your name, email address, race organization/group, and a valid phone number. RaceThread will verify the information offline and once confirmed provide that user with the ability to update and change race information in the future without RaceThread approval. The details of my race (date, description, course maps, etc) are incorrect or need to be updated, how do I change them? Coming soon, we will have even more features, marketing tactics and functionalities for race directors to be able to purchase. 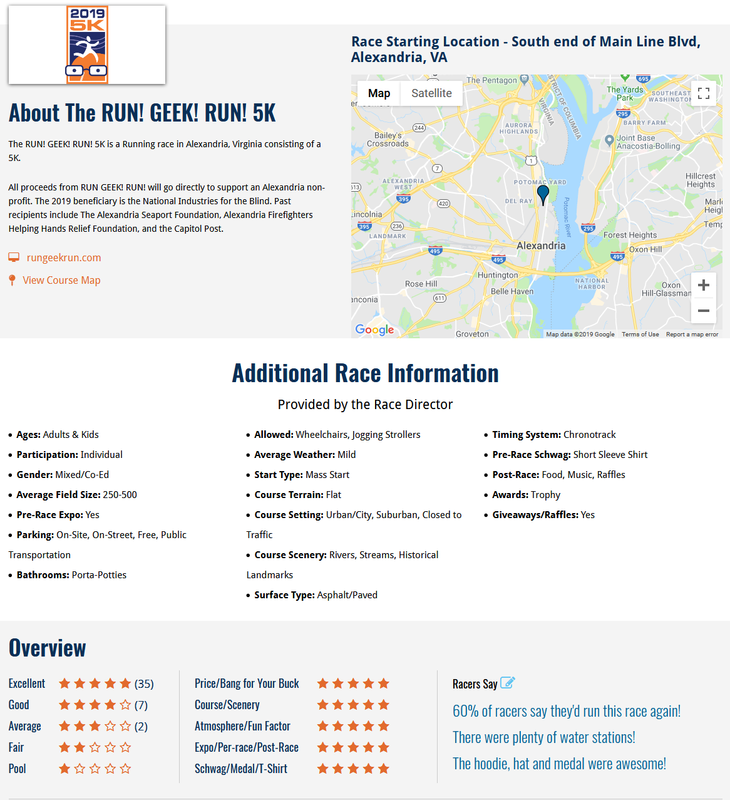 These features will include things like increased communication of your race throughout our site (Advertising on other pages, dedicated blog posts about your race, becoming a Featured Race on our homepage, etc. ), social media interaction through our own athlete community and increased access to race information and profiles.